The OECD has published the biggest ever global school rankings with Asian countries coming in the top five, in the first truly global survey of education standards. Singapore is in the lead again followed by Hong Kong, South Korea, Japan and Taiwan. Finland, well known for its high quality education, was the top European country coming in sixth, while Sweden fell to 35th place, following warnings from the OECD that it had serious problems in its education system. The US was well down in 28th place. African countries dominated the bottom rankings with South Africa and Ghana coming in last. In the last similar study, the 2012 Pisa tests, Singapore was in second place with China in first and Hong Kong third. The OECD's education director, Andreas Schleicher, said that many high performing Asian countries are excellent at attracting the most talented teachers. "If you go to an Asian classroom you'll find teachers who expect every student to succeed. There's a lot of rigor, a lot of focus and coherence," he said. 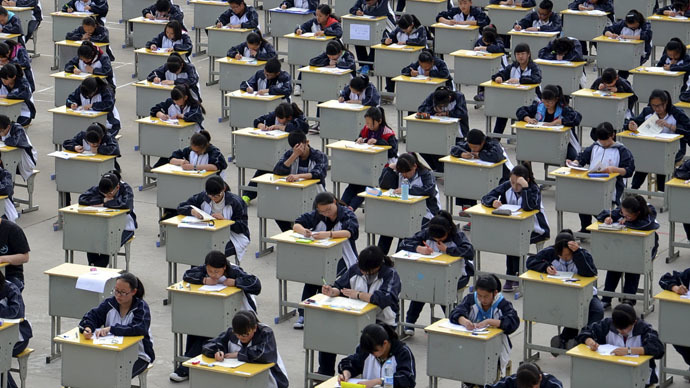 Unlike the latest Pisa test in 2012, which looked at 65 mainly developed countries, the 2015 OECD rankings based their test score on 76 countries, as well as attempting to show the link between education and economic growth. "This is the first time we have a truly global scale of the quality of education. The idea is to give more countries, rich and poor, access to comparing themselves against the world's education leaders, to discover their relative strengths and weaknesses, and to see what the long-term economic gains from improved quality in schooling could be for them," said Schleicher. Unlike the OECD’s 2012 Pisa tests, the 2015 test scores were based on knowledge of maths and science among 15 year olds. The 2015 rankings bring together a number of international assessments, including the Pisa tests, which include reading as well as maths and science, the TIMSS tests, run by US academics and the TERCE tests in Latin America. The results will be formally presented at the World Economic Forum in South Korea next week, where the UN is holding a conference on raising global standards of education by 2030. The conference will mark 15 years since world leaders set targets for education, many of which, such as providing all children with primary education, have not been achieved. The key writers of the report, Eric Hanushek from Stanford University and Ludger Woessmann from Munich University, say that education is a very important factor in the long term wealth of a country. "Poor education policies and practices leave many countries in what amounts to a permanent state of economic recession," the report reads. If Ghana, which came bottom on the table, managed to achieve basic skills for its 15 year olds, it would increase its current GDP 38 times.